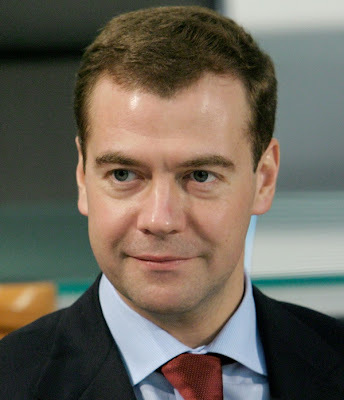 KIEV, Ukraine -- Russian President Dmitry Medvedev will visit Ukraine in May, setting the seal on a return to normal relations between the neighbours after five years of acrimony. A statement by Ukrainian President Viktor Yanukovich's media service said the two sides had agreed May 17-18 for the visit which will be Medvedev's first to Kiev since taking over the top Kremlin job in May 2008. Relations between Ukraine and its former Soviet master plummeted under Ukraine's former pro-Western President Viktor Yushchenko whose drive for NATO membership and nationalist policies upset the Kremlin. Ties between the two are still strained by long-term gas agreements between Kiev and Moscow which were signed in January 2009, ending a three-week gas "war" between the two countries. The dispute caused Russia to cut off supplies of natural gas to Ukraine, the transit route for its oil and gas to Europe, leaving millions in the European Union without heating. Since the election of Yanukovich, seen as far more Moscow-leaning in policies than his predecessor, both sides say the way is open to turn a new page and get relations back on track. On a visit to Moscow this month, shortly after his inauguration, Yanukovich suggested he might reverse some of Yushchenko's policies. He suggested he would let Russia's Black Sea Fleet remain at its base in the Crimean peninsula port of Sevastopol after the current lease expires in 2017. Yushchenko had stressed he wanted Russia out by the deadline. He also said he would scrap orders signed by Yushchenko which elevated two World War II-era nationalists reviled by Russia to the status of "Heroes of Ukraine". Yanukovich, whose country has been badly battered in the global economic downturn and is struggling with chaotic public finances, is pushing to renegotiate the long-term gas agreements and get a softer deal on pricing. For Russian gas in March alone, Kiev has to find $700 million, according to new Prime Minister Mykola Azarov. A Ukrainian government delegation headed by Energy Minister Yuri Boiko is going to Moscow next week for talks on the agreement but the Russian leadership has made no promises that the onerous gas bills will be reduced. The Russian state energy giant Gazprom (GAZP.MM) has said many times in the past that it is satisfied with the present agreement and sees no reason for it to be renegotiated. Better relations between the two powers are also sought by powerful Russian business groups which already have operations in Ukraine and are seeking to strengthen their position on the potentially lucrative Ukrainian market.